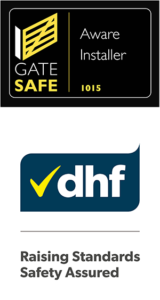 As members of Gate Safe and the Door and Hardware Federation, at Gate Auto we take safety seriously. With 30 years experience as automation installers and suppliers we are experts in our field. 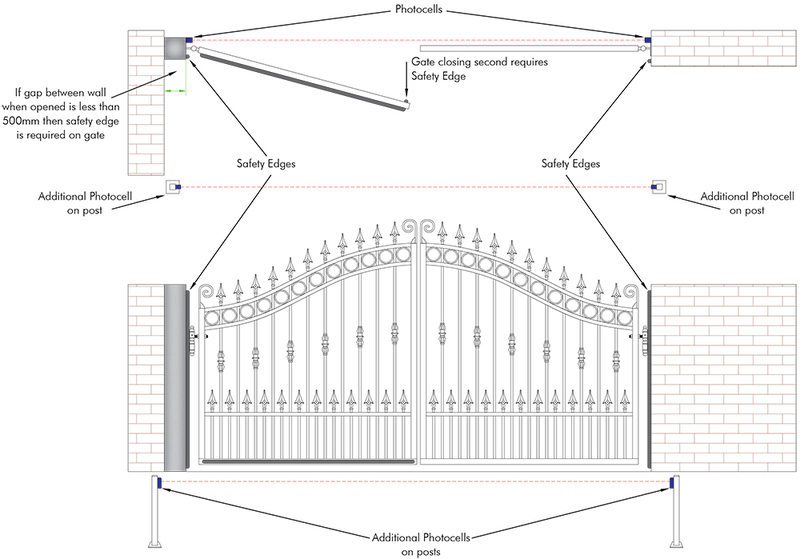 Below are a couple of examples of standard safety set ups for the most common gate types. Many installations may require further safety measures due to site conditions or usage so use these only as a basic guide to understand the principles of gate safety systems. If you are in anyway unsure about the requirements for your installation then just give us a call on 01282 677300 and our helpful team can walk you through any potential issues and determine your requirements. 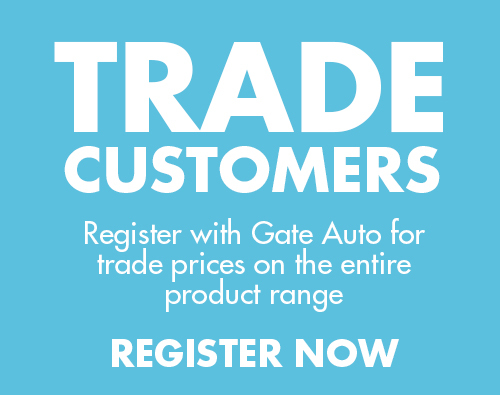 On swing gates you have various potential trapping/ crushing points to be aware of that could potentially cause serious harm to people or damage to vehicles. 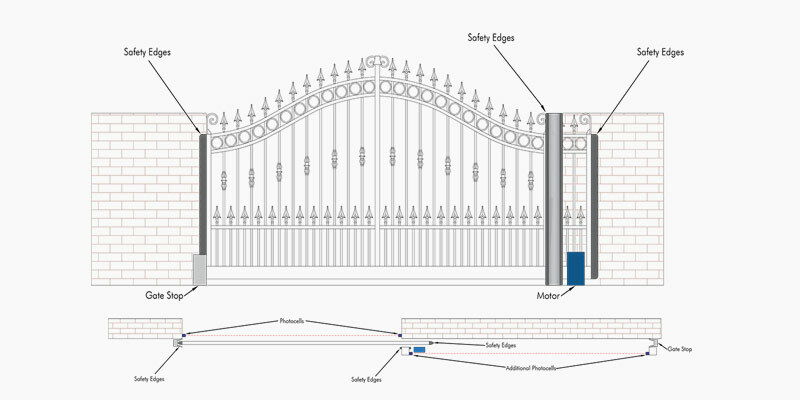 You will require a safety edge along the inside of the gate leaf which closes second – if the safety edge comes in to contact with an object (like a child stood between the gates), they will stop the operator immediately and reverse away. Gates with uneven gaps underneath and with reducing gaps under the gate during the operating cycles also have a risk of causing serious injury to pedestrians. A safety edge located on the bottom rail will offer protection. If the distance between the wall, post, kerb etc. and the gate when fully open is less than 500mm then a person could easily become trapped or crushed in this space. Safety edges are needed to prevent any possibility of this happening. It is worth noting that our 24v swing gate automation kits provide additional safety measures with ‘stop and reverse’ obstacle detection. Like swing gates, there are a few areas which you need to be aware of with sliding gates that may present hazardous trapping points on your installation. Whether the gate is opening or closing, it causes a hazard at each end as the gate can trap or hit a person/vehicle with considerable force. Safety edges along both ends will make the gate motor stop and reverse if they touch an obstacle in their path. You will need safety edges on either side of your posts as this shear gap poses a drawing-in risk. If you were to put an arm through the gate when the gate is either opening or closing you would need it to stop and reverse immediately when contact with the posts is made. Placed either side of your entrance the infra-red beams will stop the gate motor if the beams are broken. So whether it is a person walking through or a car stopped in the entrance way, the motors will not close on them. You can have an additional set of photocells mounted on posts for further vehicle protection if desired. With sliding gates there are other parameters which could influence what safety measures you will need to take such as being installed alongside railings where a hand could fit through and also the distance that it is positioned away from the wall when open which could create a trap. We would strongly advise you to call us on 01282 677300 to go over your requirements prior to purchase. Please note: You must take gate safety seriously as automated gates are heavy and have strong forces operating them. These diagrams are meant as a basic guide to help you understand the principles of gate safety equipment implementation, they are not intended as a ‘one set up fits all’ blue-print for installation and may not apply to your install so please do call us for advice if you are at all unsure…after all, it’s better to be safe than sorry.